Turkish voters have inflicted a humiliating blow to President Erdogan. 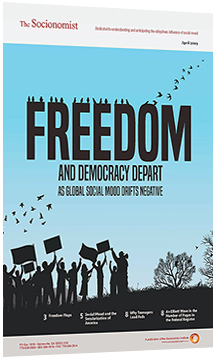 The results are a manifestation of a multi-year negative social mood trend in Turkey. In local elections last weekend, Erdogan’s AKP party appeared to suffer heavy defeats, losing control of administrations across the country including the capital Ankara and Turkey’s beating heart of Istanbul. True to form, the firebrand Erdogan is contesting both those headline-grabbing results. Nevertheless, Turkish voters have registered their disapproval of Erdogan’s leadership. Politicians, no matter how much power they think they have, are like flotsam and jetsam on the waves of social mood. Socionomic theory holds that society’s mood regulates both stock prices and the public’s perceptions of its leaders. As social mood trends positively, financial assets rise and incumbent politicians are given credit. As social mood trends negatively, financial assets fall and incumbent politicians are given the blame. Our chart below shows the Turkish stock market denominated in Euros. Erdogan had been the Turkish Prime Minister from 2003, and he rode a wave of positive social mood as Turkish stocks-in-euros advanced six-fold to their 2013 peak. That positive social mood propelled Erdogan into the presidential office in 2014. Since its peak in 2013, the Turkish stock market in Euro terms had declined over 60% before last weekend’s elections. Thus, social mood in Turkey has been trending negatively for some time. Our analysis suggests that the negative mood trend is not over, nor the bear market in Turkish equities. We therefore anticipate major changes in Turkish politics in the months and years ahead. Murray Gunn is Head of Research for Elliott Wave International’s Global Market Perspective.